GUESS Kids is Too Cute! I was browsing children’s fashion online when I stumbled upon my latest favorite brand, GUESS Kids! I know I wrote about the cute, printed fashions that my daughter loved, but I didn’t realize that GUESS Kids had such cute styles for boys as well! I’m in love with these bright bold Big Boy Flat Front Belted Shorts. I think I might pick them up in multiple colors. The blue and the green are perfect for spring and if I’m feeling especially adventurous, I’ll grab the red as well. They’re perfect for my little boy who loves to run around all day and night. Every boy needs a light spring jacket and that’s where the Big Boy Lightweight Union Jacket comes in to save the day. It’ll go with everything else my son has in his closet and it’s perfect for those early spring days when it’s still a little chilly. I think the white lining gives it that retro look, which I absolutely adore. 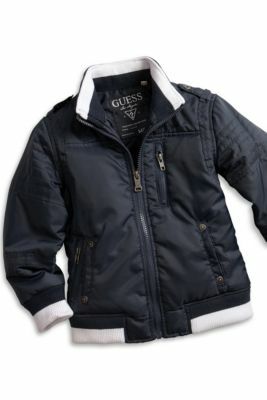 I guess it is back to the GUESS Kids website to buy some cool kid clothes for my boy! Thank goodness for free shipping when you spend over $75 (with code FREESHIP75). NextLearn how to be a Mystery Shopper! #win $100 Paypal Cash! How to lower your cell phone bill – Join an Innovative Beta Program!